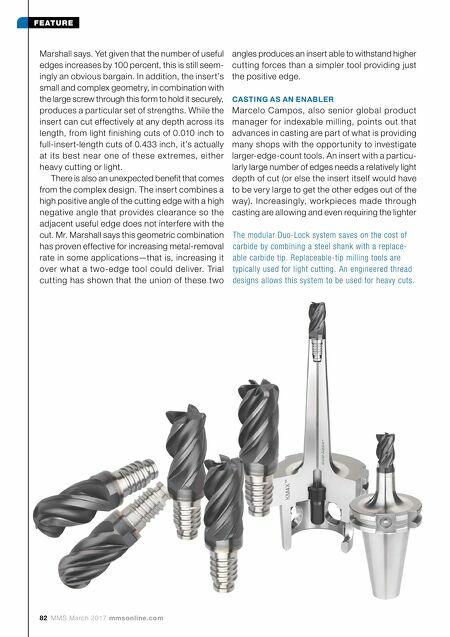 mmsonline.com March 2017 MMS 83 FEATURE depths of cut, because modern foundries are getting better at casting parts to near-net-shape. For cast iron, Kennametal's high-edge-count tool is its Mill 16 system. Each octagon-shaped insert in this system has 16 usable edges. Featur- ing a chipbreaker appropriate to high chip flow in iron and a multilayer AlTiN/AlTiCrN coating, the tool has also proven effective in milling compacted graphite iron (CGI). The application challenge with this tool is simply managing the large number of edges, Mr. Campos says. In indexing this tool from edge to edge, par ticularly on a cutter body holding a dozen or more inserts, it would be easy to skip an edge, thereby getting one insert out of sync with the others and missing some of the produc- tive capacity of the tool. Shops using a high- edge-count system such as this therefore need to implement basic procedures and disciplines aimed at avoiding this oversight. A simple design feature of the inser t that helps with this is the numbering of the edges. Using numbers molded into the insert itself, the operator can see that he is orienting all of the inserts in a given cutter to the same edge at once—edge 15, for example. Similarly, the pockets holding the inserts in the cutter body are numbered as well. Here, the need is perhaps less pronounced, but Mr. Campos says shops making the most precise cuts in cast iron or CGI might want to make use of this num- bering as well. "Even a precise cutter body features some tiny variation from pocket to pocket," he says. "The insert wear is influenced by that variation." Unintentionally moving an inser t to a dif ferent pocket therefore might affect the cutting radius of the tool to a tiny but measurable extent. The numbering of the pockets enables users to con- trol against this variation. MODULAR MILLING One final example involves not multiplying the number of usable edges on an insert, but instead multiplying the number of times the body of an end mill can be used by allowing it to change cutting heads. The "Duo-Lock" system, developed in partnership with Haimer, is a modular milling tool system that saves on the cost of carbide by c ombining a ste e l s ha nk w ith a re plac e a ble Kennametal, call 800-446-7738 or visit kennametal.com. carbide tip. 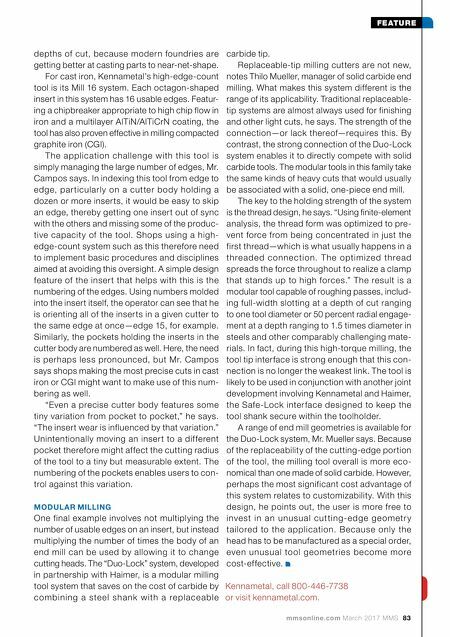 Replaceable-tip milling cutters are not new, notes Thilo Mueller, manager of solid carbide end milling. What makes this system different is the range of its applicability. Traditional replaceable- tip systems are almost always used for finishing and other light cuts, he says. The strength of the connection—or lack thereof—requires this. By contrast, the strong connection of the Duo-Lock system enables it to directly compete with solid carbide tools. The modular tools in this family take the same kinds of heavy cuts that would usually be associated with a solid, one-piece end mill. The key to the holding strength of the system is the thread design, he says. "Using finite-element analysis, the thread form was optimized to pre- vent force from being concentrated in just the first thread—which is what usually happens in a thre ad e d c o n n e c tio n. T h e o ptimize d thre ad spreads the force throughout to realize a clamp that stands up to high forces." The result is a modular tool capable of roughing passes, includ- ing full-width slotting at a depth of cut ranging to one tool diameter or 50 percent radial engage- ment at a depth ranging to 1.5 times diameter in steels and other comparably challenging mate- rials. In fact, during this high-torque milling, the tool tip interface is strong enough that this con- nection is no longer the weakest link. The tool is likely to be used in conjunction with another joint development involving Kennametal and Haimer, the Safe-Lock inter face designed to keep the tool shank secure within the toolholder. A range of end mill geometries is available for the Duo-Lock system, Mr. Mueller says. Because of the replaceability of the cutting-edge portion of the tool, the milling tool overall is more eco- nomical than one made of solid carbide. However, perhaps the most significant cost advantage of this system relates to customizability. With this design, he points out, the user is more free to inve st in a n unusual cu t ting- e dge ge ometr y tailored to the application. Because only the head has to be manufactured as a special order, even unusual tool geometries become more cost-effective.